You may (or may not) recall that when I did my review of the Bandai Jumbo Astro Megazord, I mentioned that there was a version released in Korea. Well, I managed to get one recently so you get a review of it. This won't take too long as it's essentially the same toy with one difference, but sold in a new box. Beyond that, it's the same mold, same transformation, same stickers, same weapons, etc... I will note here that before I sat down to write this review I figured I would transform it to vehicle mode (and hopefully get it right this time! ), but I found that the connection points were extremely tight and nothing fit as easily as it did on the regular version. So I decided not to push the issue and just left it as is. OK, packaging next. 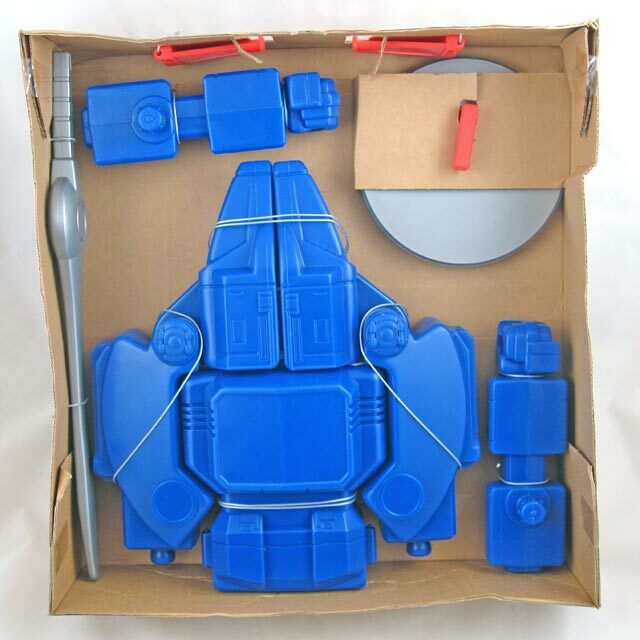 The box for this version is much larger than the others and the reason for it is because the toy comes pre-assembled in robot mode and resting in a large plastic tray. This is very similar to the strange packaging for the Korean King Of The King jumbo. Both are knockoffs of toys that were made to be disassembled and placed in smaller boxes sold assembled in even bigger boxes. This is how it was originally packaged..
..resulting increase in box size. But you know what? I'll take a bigger box if it means I don't have to put up with twisty ties! You may have noticed that this release also comes with some things that the regular versions do not, namely a couple of rectangular cards featuring a picture of the robot and the rangers, respectively. Also, 3 round cardboard cards with art of the rangers are also included. These are a bit weird as they seem like coasters more than anything else. Also included in the box is a sticker sheet, instructions and catalog. I don't see a year of manufacture on the box so I'm going to assume it was the same year as the regular version. There is a sticker on the front of the box that says "Toei Co. Ltd./Sunny Home Video(1)" so I guess that means this is licensed. Korea Animation Vision (코리아애니비젼) is listed as the manufacturer. $2500, maybe, but that much?! I thought you'd won it in an auction, and I felt that was too much. Oh, "won"! Hahaha.. I didn't even think of that. No, that will always be the original price in that field, not necessarily what we actually paid. I just wrote "won" because we don't have any other currency symbols besides yen and dollars to chose from. If you must know, I paid $150 shipped from Korea for this, which I thought was not bad considering a) how hard it is to get one of these and b) how big the shipping box was. I think I'd call that $25000 lost. Awsome, I love the swapped arms! Given there are Japanese versions of the true Power Ranger jumbos (just different boxes, as far as I can tell), I guess I'm not surprised there are multiple versions of this. Admittedly, I wouldn't have known there was a Korean version, though. Not sure if you're aware, but there is a Canadian version also, with a different box. I don't own it so not sure if there are any physical differences from the American version, though I would doubt it. It's kind of odd this toy exists at all in any form. It seems to have been thrown out there on it's own with no other toys in it's category. It doesn't fit with the other Power Ranger jumbos because of it's size and transforming. And there is a slightly smaller version of this toy made of more common plastic material that fits in better with other Power Rangers and has a more traditional transformation like other transforming toys. But, that being said, it's close enough to a jumbo (and cheap) that I had to get one. Well, at least the American version. Don't have a whole lot of interest in the other versions unless I just happen to run across them. I've never seen a Canadian version. Is it in French or something? Also, there are no Japanese versions of the Power Ranger jumbos, unless you mean the Jumbo Hero Gourai Senpuujin, but that's a completely different toy. Actually, there was a guy selling a Power Ranger jumbo in a Japanese box. He had photos of it and the box was clearly different than the American version. I almost purchased it, along with a couple other jumbos I bought from him, but it seemed to be the same as the American version other than the box, so I couldn't see spending the $150 or so he wanted for it. I'm not sure if that is the only Power Ranger jumbo that comes in a Japanese box or if all of them did. It was the one with the big yellow circular chest (not sure of it's name, off the top of my head). I naturally assumed there must be Japanese boxes for all off them. As for the Canadian version of the Astro Megazord, I could be mistaken since the picture was small that I saw, but it may have been a picture of the back of the box which I mistook for a Canadian version. I'll have to go dig up my Astro Megazord to double check. If it was the front of the box, it's a completely different box. That's the Jumbo Hero Gourai-Senpuujin. Yeah, that's a jumbo vinyl. Yeah, that's a jumbo vinyl. I think it's 20-21" tall (to 22" for the US Jumbo) and obviously a different material and sculpt. That piece, like the Jumbo Astro Megazord, is also a strange one-shot release. I think JoshB used to have one, but I didn't see a review of it in our archives.